The ongoing corporate results and the Union budget are also making participants tread cautiously though the GST agreement provided some relief. Growth concern cast its shadow on the market as the flagship Sensex slipped marginally to close at 27,236 after IMF sharply lowered India's GDP estimate, with RIL proving to be a drag too. The multi-lateral agency had cut India's growth rate for the current fiscal to 6.6 per cent from its previous estimate of 7.6 per cent due to the "temporary negative consumption shock" of demonetisation, which made investors anxious. Reliance stock was in a tight spot as spending worries surrounding its telecom venture took some sheen off its quarterly results. After opening higher, the 30-share BSE barometer hovered between 27,381.43 and 27,179.19 before ending at 27,235.66, showing a fall of 52.51 points, or 0.19 per cent. The gauge had gained 50.11 in yesterday trade. 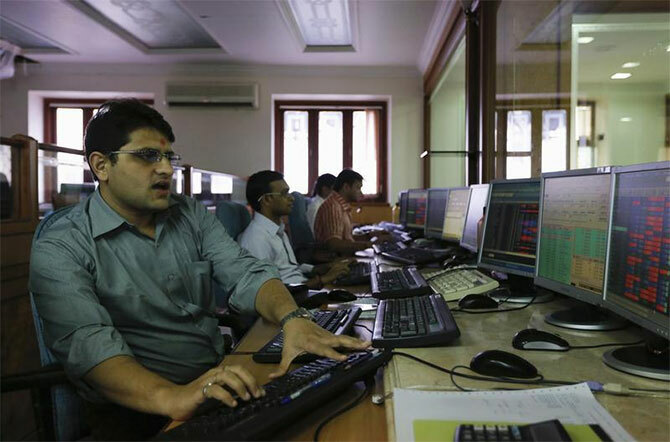 The 50-share Nifty index fell 14.80 points, or 0.18 per cent, to 8,398 after shuttling between 8,440.90 and 8,378.30. Key index heavyweights in metal, oil and gas, PSU, auto and banking sectors fell up to 1.52 per cent. Index major RIL yesterday reported a 3.6 per cent rise in its third quarter net profit. After making a weak opening, shares of the company lost 3.31 per cent to close at Rs 1,041.30. Among the major losers, Coal India fell 2.14 per cent, ONGC 1.74 per cent, Adani Ports 1.68 per cent and HDFC 1.02 per cent. NTPC advanced 3.08 per cent, Asian Paints 2.72 per cent, Axis Bank 1.98 per cent, HUL 1.52 per cent and ITC 1.35 per cent. Sectorally, the bright spots were FMCG, power, IT, realty, technology and consumer durables. Foreign portfolio investors (FPIs) sold shares worth a net Rs 347.25 crore yesterday, as per provisional data. Overseas, Asian and European stocks were mixed as US financial markets remained shut yesterday for Martin Luther King Junior Day. In Asia, Japan's Nikkei fell 1.48 per cent as investors remain cautious ahead of a Brexit speech by UK Prime Minister Theresa May and Donald Trump's inauguration as US President. However, Hong Kong rose 0.54 per cent and Shanghai gained 0.17 per cent.